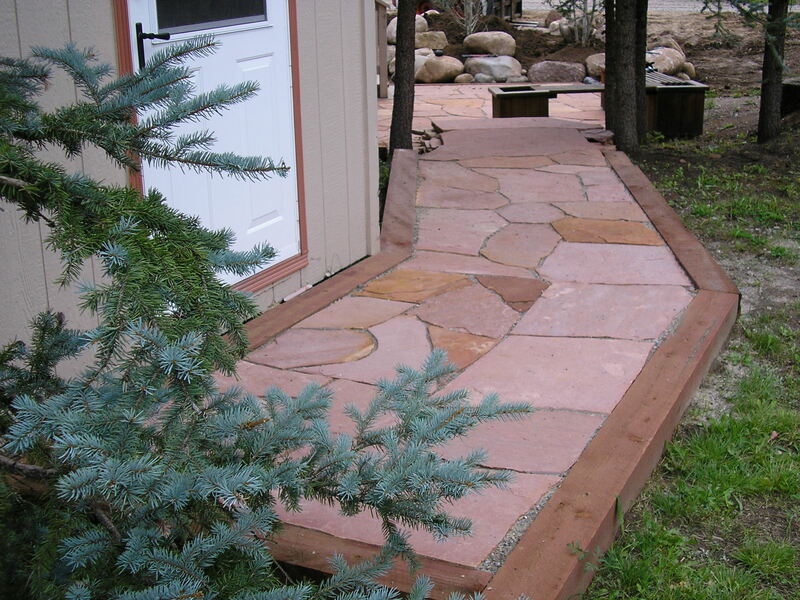 The purpose of this post is to outline how Gardenhart Landscape & Design cuts and fits flagstone, for use either in a patio situation or pathway application. There are probably other methods in use by different contractors, but this is the technique I learned thirty years ago by a Master Stonemason. Of course, I have my own take on what looks proper and it will vary with the individual who places and cuts the stone. 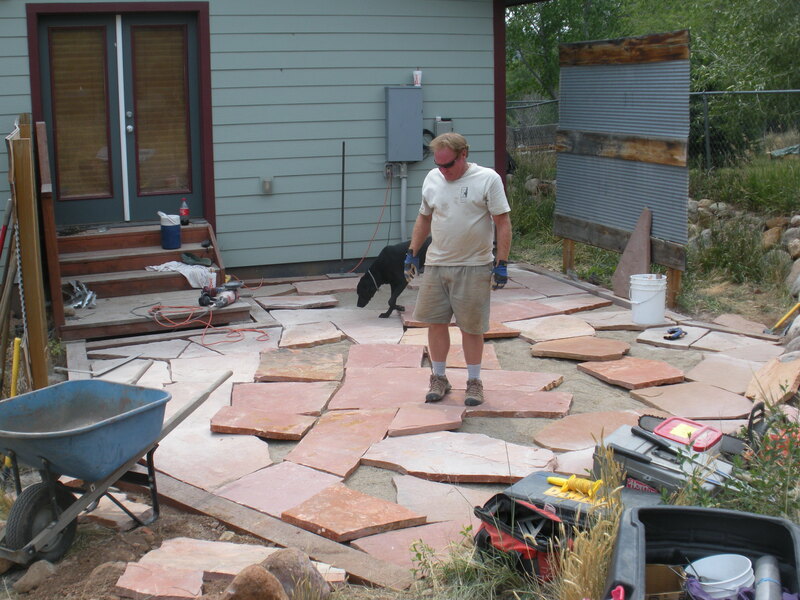 We will start with the assumption that you have determined the location of the patio and proper drainage issues resolved, you have also decided what material will contain the sand base ; natural stone, treated timbers or some manufactured flexible edge product. You have also properly compacted a sand base to set the stone upon and allow you to level the individual pieces of stone. need to get to the hardware store for a diamond blade. 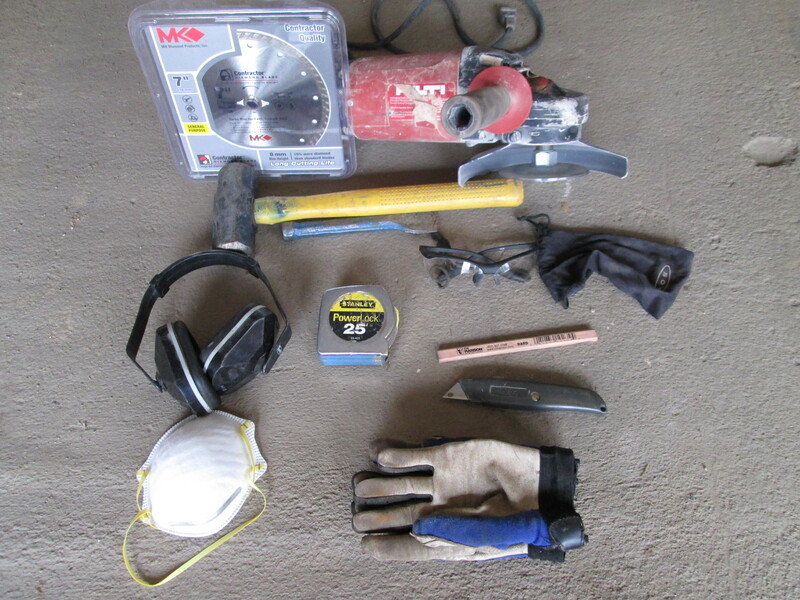 Before you go to the store, make sure you also have the following tools on hand: safety glasses, hearing protectors, dust mask,gloves, stone mason’s chisel, hammer, carpenters pencil with hard lead, tape measure and a level. 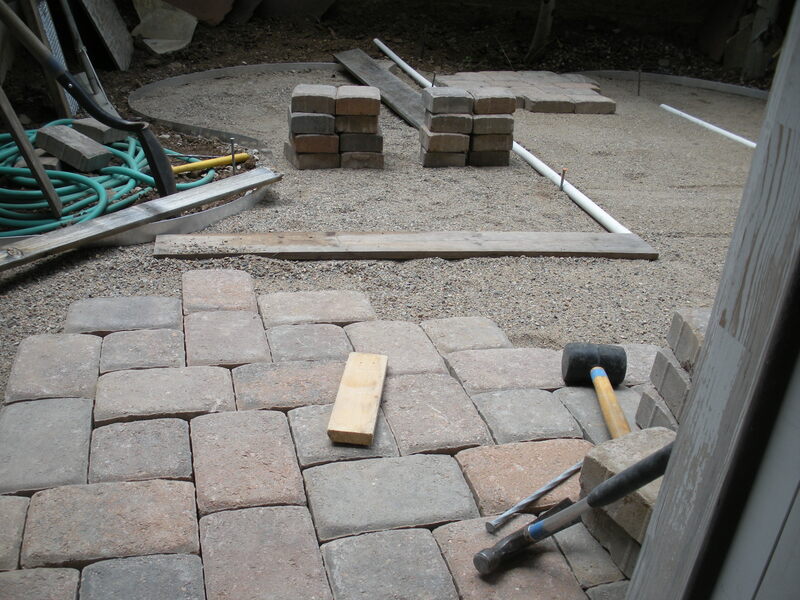 The first thing I do is to unload about half of my stone from the pallet and lay it out around the work site so that I can see each piece, but be sure not to put them in the patio area just yet. This helps me find pieces that will naturally fit in specific locations. Then, starting at the edges, I place the most obvious pieces first, curved pieces against the curved edge or square pieces along straight area or in corners. Always keep in mind how to fit them naturally together and how much cutting will be required to fit them together. Place pieces that naturally go together, starting with the edges. and might require minimal cutting and you have used most of the pieces you unloaded from your pallet. Time to get the pencil and start marking where you will cut the pieces so that they fit well together. I make my gaps between individual stones about the width of my thumb or a little larger, try to be as consistent as possible. Mark with your pencil where you will cut , put your safety gear on and start cutting along the line you marked. Do not be in a hurry, let the blade work its way into the stone, if it sparks you might be trying to go too fast or pushing too hard. Do not worry if your blade does not cut completely through the stone, you will be able to break it. 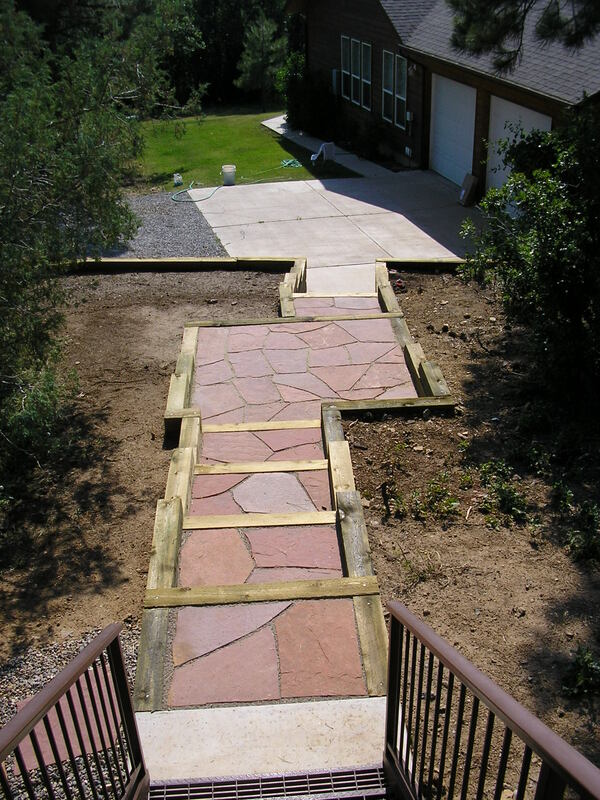 Now, you have cut several pieces and broken the waste off with your chisel and hammer you can slide the stone next to its neighbor and start to see what your patio is going to look like. Repeat this process, unload more stone , find ones that seem to go with what you have already cut, place and mark them and then cut them to fit. Soon, you will come to the conclusion that they all do not fit without being cut on at least three sides and the fast progress is over. Try to minimize the cutting and waste, remember that you paid for stone by the pound and you do not want to go back for more. 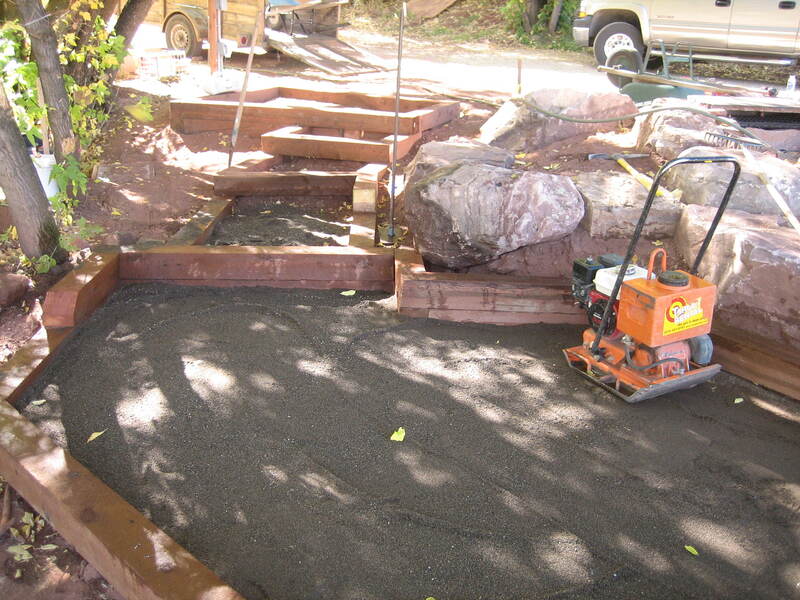 Of course,we at Gardenhart Landscape & Design offer this information in the hopes that you decide that this process requires experience and skill and you will hire us to do your landscaping instead of doing it yourself. As with many things, there is always details that are hard to share but easy to see in the finished product. We have a you tube video that shows this process too! 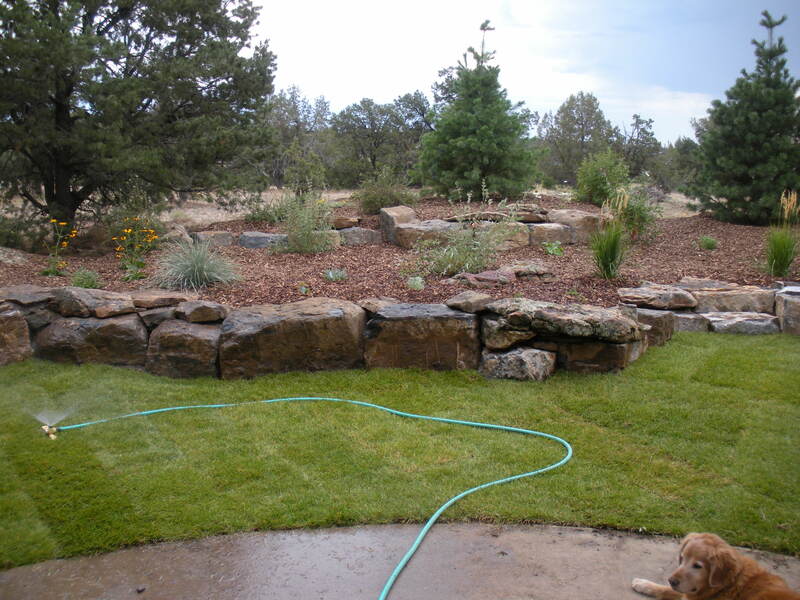 Landscape Watering Dilemmas in Durango Colorado: How Much? How Much Do I water these Trees and Perennials? How much do I water my SW Colorado landscape? There is a very similar outcome when you water too much or too little. One way to really decide whether to water or not is to actually feel the soil. If you will dig down about three inches and grab a handful of soil and try to squeeze it into a ball. If it sticks together, then it still has sufficient moisture. The problem with over watering is that the water molecules replace the oxygen in the soil and causes distress to plants. It seems to me that my garden has not been growing very well and perhaps it is because it has been over watered. 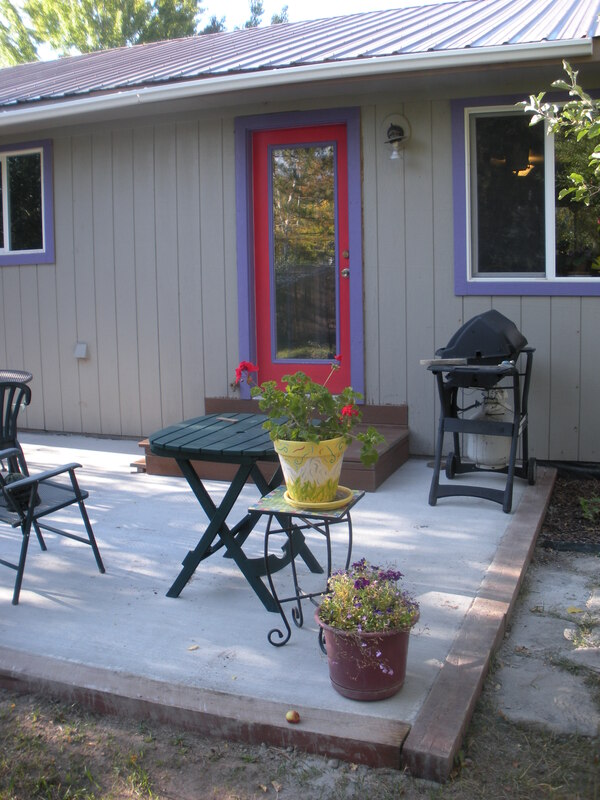 The soil at my house is very hard packed river bottom and even though we have tilled the garden area and applied compost and soil amendments numerous times, we still do not have a “well-drained soil”. Watering here is difficult, too much and it runs off and not enough we water only the surface, which encourages shallow roots. Ideal soil will absorb water down to about eighteen inches or deeper, then allow it to gradually dry out over a predictable period of time. The plant roots will seek the moisture by going deeper in the soil, thus they are less susceptible to dry times. How Much Water Does Sod Need? In summary, watering is very site specific, depending on your soil composition and the requirements of the individual plants. As long as the soil will absorb water, deep watering is preferred. You must pay attention to what is going on with your plants and the soil they are trying to grow in. Please review us on Google Places. Monument Plant (Frasera speciosa) Green Gentian in Bloom Now: The Tallest Wildflower I’ve Seen! 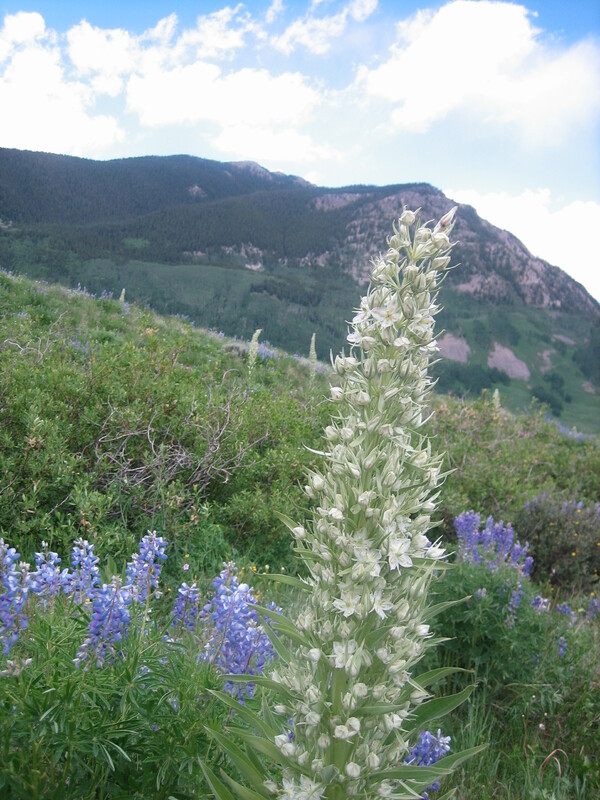 While I have been out in the alpine regions of Colorado, recently, I have been seeing the tallest wildflower blooming. These tall spikey, green multi-flowered plants are called the Monument Plant, (Frasera speciosa) or Green Gentian. I haven’t seen a good show of these wildflowers for many years. So I started to wonder why they bloom en masse so infrequently. I did some research and found out that the indicator to a good blooming period is for a wet July & August, 4 years prior….can you imagine that it takes four years for a plant to bloom like this? It is a monocarpic plant, i.e., one which grows many years, flowers once, then dies. Perhaps the most well know monocarpic plant is the Southwest’s Century Plant. 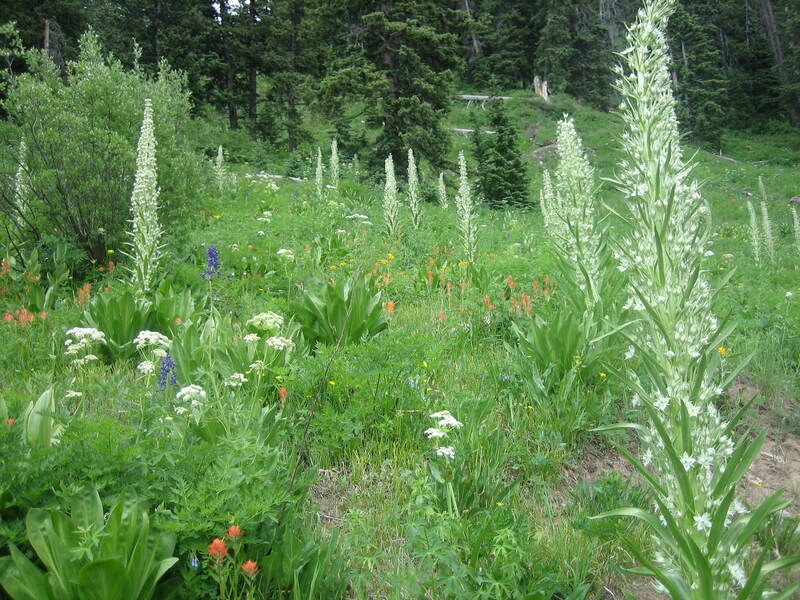 A great local webpage by swcoloradowildflowers.com is found at http://bit.ly/a7sVWa which provides a lot more information and great photos! I have seen great displays at Coal Bank Pass and in Crested Butte Colorado. I recommend to get out and see some of these tall wonders. They are amazing. 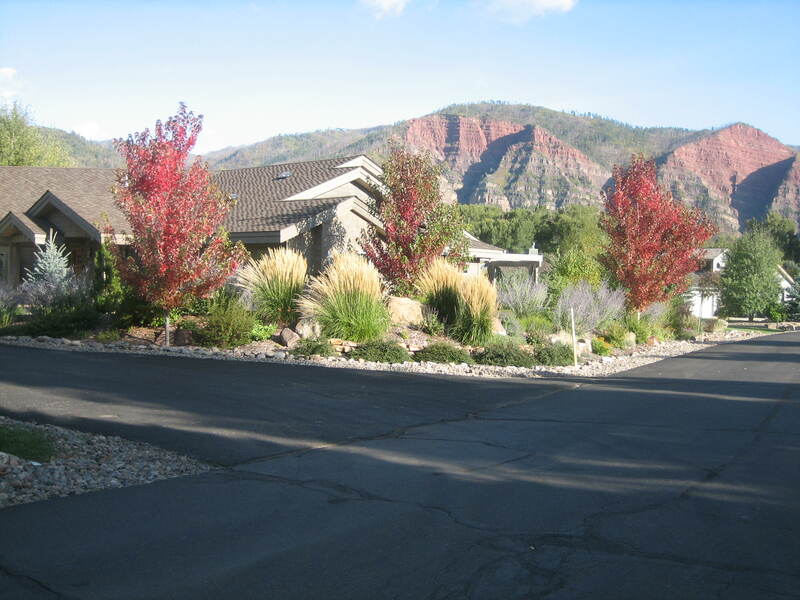 This link directs you to the unsuitable trees as recommended by the City of Durango. The list of trees on the link are not planted in Durango because of one or more of the following undesirable characteristics: Prolific seed production, invasive habits, fruit, pods, thorn bearing, weak limbs and/or structure and insect and disease problems. According to Ron Stoner, one of the city of Durango’s favorite trees is the Wasatch Maple. It is very hardy and looks great! 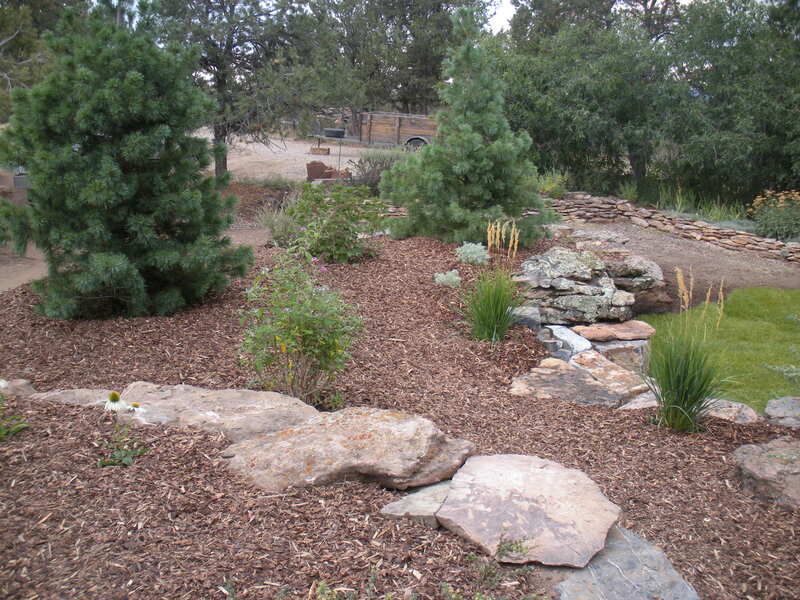 Durango nursery lists all zone 3 shrubs and trees. If you have other questions about type, location and watering schedule for certain trees, let me know. How do you deal with the critters that are hungry? Early spring when there is little to eat, the deer and rabbit are pervasive. It is very difficult to keep them out of gardens and from eating my early blooming bulbs. They both eat my daylillies and tulips on the south side of my home every year. 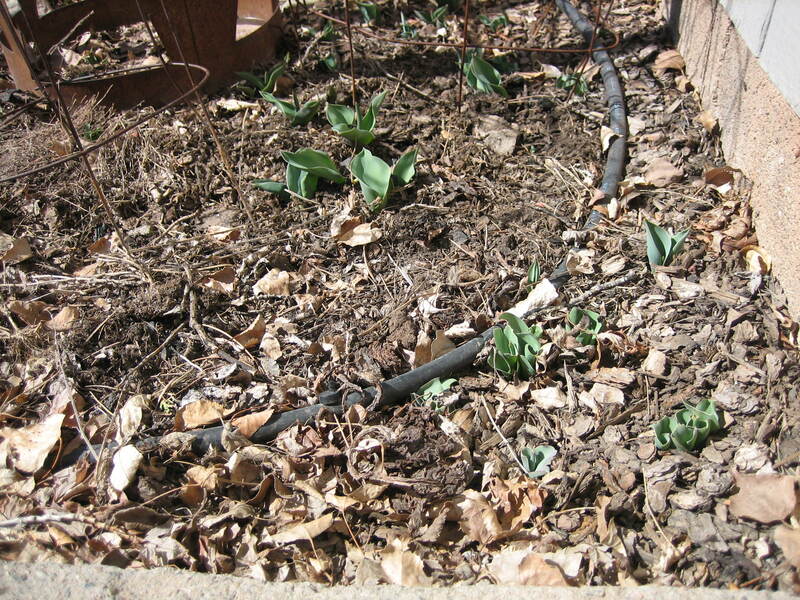 Daffodils, rhubarb and grape hyacinths generally go unscathed. Amazingly also they will nibble on the fresh new growths of rose bushes, of which there is only one in our yard. Several of our local Durango gardeners like to use a product called Bobex, which is sprayed on your plants. It makes the plants unappetizing to these critters and they are less likely to eat them up. I do not have personal experience with this product, but some swear by it. I also think that there are several other brands that work the same way, I would ask at your favorite garden center for their personal preference. Organic Gardening Magazine has several ideas on how to control garden pests. Locally, Durango Nursery and Supply’s recommended zone 3 perennials that are more resistant to deer is a very helpful list. The only really proven way to control the deer and rabbits is to put up a very big and sturdy fence. This past January a snow slide hit a house. This Durango house was adjacent to a cliff, with little landscaping above it. If you are located in potential slide area, Gardenhart Landscape and Design recommends planting evergreen trees above and throughout the avalanche run out zone. 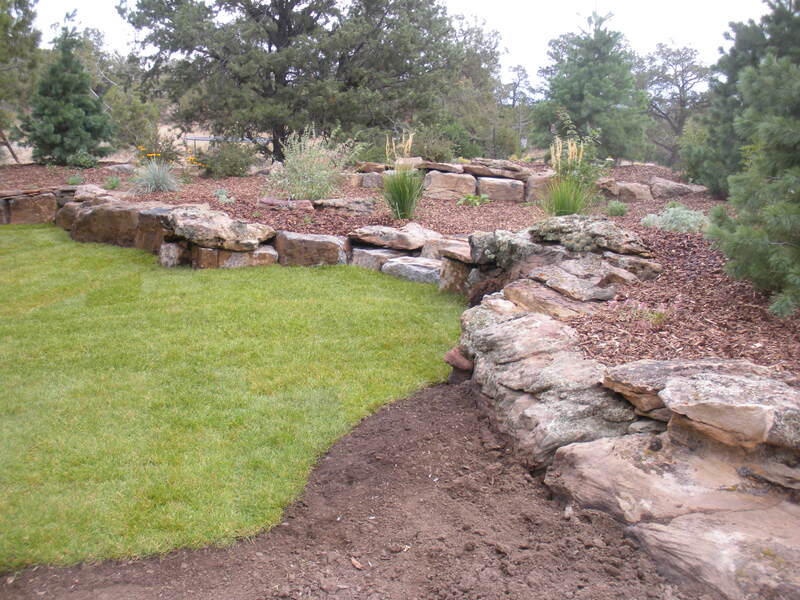 Another thing that you could do would be to protect the home with rock outcrops above the home. Overall the best landscaping tactic is tree planting, as the trees will slow down the overall run-out. Obviously when looking at new homes, it is best to be wary of purchasing anything that abuts any cliff or dirt, especially brand new construction. The amount of drainage from such area may be unknown, and destructive, plus weather patterns may change. The major accumulation of snow would be the north side slope, but a west and south-facing slope may melt faster.